A PSU student, an English professor, and the region’s economic development agency were honored by the Campus Compact for New Hampshire (CCNH) at its annual Presidents’ Awards presentation. CCNH is a statewide consortium of college and university presidents dedicated to advancing the civic purposes of higher education. Chelsea Desrochers ’13 was honored with the President’s Leadership Award, which recognizes students who have made outstanding contributions to civic engagement. Desrochers is the president of PSU’s Habitat for Humanity chapter, oversaw student volunteers for PSU’s Alternative Spring Break, has done service projects in the US and in countries such as Nicaragua, and is vice president of the Student Support Foundation. She was also named a 2013 Newman Civic Fellow, a recognition given to college students who have demonstrated an investment in finding solutions for challenges facing communities throughout the country. Robin DeRosa, a PSU English professor and student advisor, received the Good Steward Award, which recognizes faculty or staff members who contribute professional expertise in service to the wider community. DeRosa received PSU’s Faculty Advising Award in 2011, is a distinguished and widely published scholar in her field, and was the Theo Kalikow Award winner in 2008 for her service to women’s issues. She currently serves on the board of directors for Voices Against Violence, a regional domestic violence counseling organization that provides information and support regarding all aspects of domestic and sexual violence. The Grafton County Economic Development Council (GCEDC) received the President’s Community Partner Award, which is presented to a nonprofit organization that has enhanced the quality of life in the community in meaningful and measurable ways and engaged in the development of sustained, reciprocal partnerships with a college or university. “Each of these awards represents people who are a force for good in our region, people of whom we are proud,” President Steen said. The beauty of New Hampshire’s White Mountains was the backdrop for the unveiling of the new state quarter at a February 21 event in PSU’s Silver Center, sponsored by the US Mint and the US Forest Service. With so many treasures housed in PSU’s Museum of the White Mountains, which opened to the public in February, it can be hard for visitors to pick a favorite. But as museum director Catherine Amidon notes, there is one piece that’s particularly popular with visitors of all ages: a replica of a Concord coach, the Nancy Flyer (below). 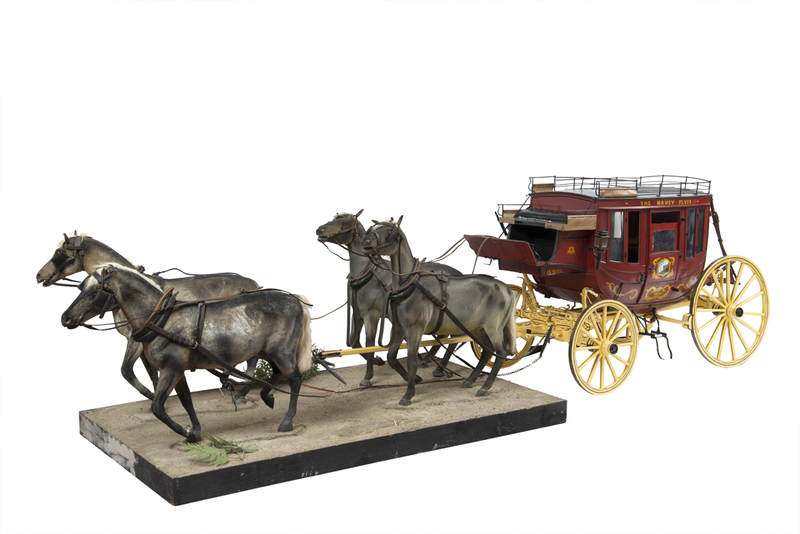 Measuring 34″ high, 48″ long, and 28″ wide, the diminutive, painstakingly detailed coach is perfectly situated in the center of the museum, and is frequently the center of attention. To see the Nancy Flyer and a host of other White Mountains treasures in person, visit the Museum of the White Mountains on campus at 34 Highland Street. Plymouth State University’s Center for the Environment (CFE) and the Squam Lakes Association (SLA) have agreed to continue a joint agreement to protect and improve the health of the Squam Lakes Watershed ecosystem through research, monitoring, education, and stewardship of the Squam Lakes Watershed. CFE and SLA have previously partnered on several research projects such as water quality, methods for reducing milfoil, a recreation study, and an analysis of land use regulations in the watershed towns. In addition, the SLA has hired PSU students for summer field positions and often supports class field trips, providing invaluable hands-on opportunities for PSU students. Currently, PSU professor Shannon Rogers is working on a study of the ecosystem services provided by the Squam Lakes watershed. A joint partnership between PSU and the Grafton County Economic Development Council (GCEDC) to create new businesses and jobs is currently under way. The Enterprise Center at Plymouth (ECP), which will open in August at One Bridge Street, will be a business incubator and accelerator that will support entrepreneurship, small businesses, and economic development in central New Hampshire by providing services, including leased space, mentoring, and networking to new and existing businesses. The GCEDC is providing the physical location and building, using $2 million in federal, state, and corporate funding; PSU College of Business Administration faculty and students will provide incubator staffing, business services, and intellectual capital for businesses throughout the region seeking advice and counseling. PSU’s new admissions viewbook earned two honors from Higher Ed Marketing’s 28th Annual Educational Advertising Awards. The viewbook, created by PSU’s Office of Public Relations and packed with beautiful photos and information on all aspects of campus life, earned Silver in the Student Viewbook category and was named Best of Show—one of only 18 entries out of 1,600 total entries received to earn this honor. PSU has been named to the President’s Higher Education Community Service Honor Roll, through the federal Learn and Serve America program, which supports and encourages service learning throughout the US. The honor roll, launched in 2006, annually highlights the role colleges and universities play in solving community problems and placing more students on a lifelong path of civic engagement by recognizing institutions that achieve meaningful, measureable outcomes in the communities they serve.